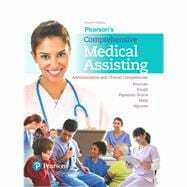 Pearson’s Comprehensive Medical Assisting, Fourth Edition, offers a step-by-step, competency-based approach that covers virtually all facets of the medical assisting profession. Filled with 227 Procedures (32 of which are new), and a variety of workplace scenarios and critical-thinking exercises, the book helps students gain the procedural, people, and professional skills that are fundamental to being an effective Medical Assistant. The Fourth Edition was reconceived around the latest standards and guidelines published by CAAHEP (the Commission on Accreditation of Allied Health Education Programs) and ABHES (Accrediting Bureau of Health Education Schools). In this groundbreaking approach, the text’s learning objectives were rewritten to directly conform to the standards, and all content was reorganized to flow from these objectives. Mapping documents demonstrate where standards for both of the accrediting bodies are met. To ensure a comprehensive, cohesive teaching and learning experience, the Fourth Edition’s ancillaries also underwent a comprehensive update, and, in the case of the Student Workbook, a significant revision. The detailed, in-depth, follow-along study guide feature, found at the beginning of each Workbook chapter, directly reflects the correlating textbook chapter, providing important reinforcement of the information. The Workbook also features brand-new activities that directly relate to CAAHEP standards, particularly CAAHEP’s Affective Competencies. The Instructor’s Resource Manual details how each chapter’s content conforms to the the specific curriculum standards of accrediting bodies, as well as the content required in various certification exam outlines. An updated Test Bank, PowerPoint Lecture Slides, and set of Lesson Plans round out the new edition’s supplement package. MyLab Medical Assisting is an online homework, tutorial, and assessment program designed to work with this text to engage students and improve results. Within its structured environment, students pursue an adaptive test of their knowledge, practice what they’ve learned, and prepare for their certification exam. Content includes comprehensive Homework Questions, Critical-Thinking Quizzes, Professionalism Scenarios, and sample Certification Exams. This edition features an update of key Procedural Videos, as well as the inclusion of new video-based Decision-Making Cases, Dynamic Study Modules, and Interactive Procedural Checklists. Nina Beaman earned a Doctorate of Education, a Master's Degree in Nursing, and a Master's Degree in Health Psychology in addition to an Associate Degree in nursing, an Associate Degree in business, a Bachelor's Degree with Honors, and the Diplôme d'Etudes Françaises from the University of Nice. She has been a Certified Medical Assistant (AAMA) since 1994 and participated actively on the local, state and national levels of the American Association of Medical Assistants. She is also a triply-certified Registered Nurse with certifications in Nursing Education, Psychiatric/Mental Health, and Ambulatory Women’s Health. She completed her doctoral dissertation on “Using Disaster Simulation to Promote Volunteerism in Medical Assisting Students. Nina is Dean of Nursing at Aspen University, but also teaches health care courses for Independence University and Fortis College. She owns a consulting firm, Positive Transitions, through which she provides crisis intervention, education, curriculum development, continuing education review, and violence prevention training. A popular speaker and author, she writes at her farm in the Shenandoah Valley of Virginia. In her spare time, she works as a forensic nurse consultant and disaster expert. Kristiana D. Routh is a Registered Medical Assistant through American Medical Technologists. She has worked in the health care field for over 16 years and has a passion to see the field of medical assisting grow and develop. Her experience in medical assisting education includes teaching, curriculum development, working closely with accrediting bodies, and writing multiple textbook and supplemental resources for both instructors and students. Kristiana also owns her own business, Allied Health Consulting Services. Her business focuses on accreditation trends throughout health care, writing and developing educational content in the field of medical assisting, and project management services for physicians and health care facilities. Kristiana and her family live in Girard, Pennsylvania near beautiful Lake Erie. Lorraine Papazian-Boyce is an award-winning author and instructor. She holds a Master’s Degree in Health Systems Management and the Certified Professional Coder (CPC) credential from AAPC. She authored Pearson’s Comprehensive Medical Coding: A Path to Success, which received the Most Promising New Textbook Award—2016 from the Textbook and Academic Authors Association. She won the same award in 2014 for her text ICD-10-CM/PCS Coding: A Map to Success. She teaches health information management at the College for Health Care Professions. She was named Educator of the Year –Instruction—2011 by Career Education Corporation (CEC). Lorraine has over 30 years of experience in health care administration as a college instructor; office manager; owner of a medical billing and coding service; and management consultant to physicians, hospitals, and nursing homes. She has contributed to numerous textbooks and journals in the health professions and is a nationally known speaker. In her spare time, she enjoys boating, RVing, hiking, and working out. Ron Maly currently holds certifications as a RMA (AMT) and CPhT (PTCB). He obtained his B.S. degree in Biology, Natural Science and Pre-Med with a minor in Chemistry from Midland Lutheran College in Fremont, Nebraska in 1989. In 1991 he received his M.A. degree (with thesis) in Biology from the University of Nebraska at Omaha. The abstract from his thesis has been nationally published. In 1992 Ron was employed with Harris Laboratories (currently Celerion) in Lincoln, NE as a Chemist and later as a Validation Scientist. In his seven years with Harris Laboratories, Ron had numerous scientific papers on LC/MS/MS pharmaceutical-based research presented at national conferences. In 1999 Ron began working as a medical assistant/histotechnologist for a Moh’s micrographic surgeon in Omaha, NE. During this time he also began working part-time as a pharmacy technician. From 2005 to 2016, Ron has held positions as a Pharmacy Technician Program Coordinator for Hamilton College/Kaplan University, Council Bluffs, IA; Medical Assisting Program Coordinator and Medical Billing and Coding Coordinator at the Omaha School of Massage and Healthcare of Herzing University, Omaha, NE; and Medical Assisting Program Coordinator and Interim Pharmacy Technician Program Coordinator for National American University, Bellevue, NE. Ron is currently employed with St. Elizabeth Hospital/CHI in Lincoln, NE as a pharmacy technician. Jaime Nguyen has more than 20 years of experience in education management, health care research and analysis, compliance, and medicine. She has managed several allied health care programs, including medical assisting, pharmacy technician, and patient care technician. Before entering the education field, she was the Medical Director and Chief Compliance Officer for a biopharmaceutical marketing and research company. Jaime was also a Public Health Analyst/Fellow in the Division of Medicine and Dentistry in the Department of Health and Human Services (HHS), where she conducted research and analysis on physician workforce issues. During this time, she also served on two federal advisory boards, Council on Graduate Medical Education (COGME) and the Advisory Committee on Training in Primary Care Medicine and Dentistry (ACTPCMD). Jaime has a Medical Degree, a Master in Public Health, and a Master of Science in Medicinal Chemistry. Her focus has been on global health and medicine and public health, and she has spent several years working in Israel, Ethiopia, and Indonesia on health care initiatives. Jaime has worked in family medicine in Madison, Tennessee and at the Allegheny County Health Department’s STD Clinic in Pittsburgh, Pennsylvania. She is currently editing a textbook on health care administration.